NPE M700 is a series of industrial computers which you can easily adapt to your needs by choosing from the available options. Upgraded NPE M700 industrial computer series is powered by Quad-core Cortex-A7 1.2GHz processor, eqiupped with 1GB DDR3 RAM, 8GB eMMC on-board and Gigabit Ethernet for high performance. NPE features industrial protocol support, e.g. Modbus, M-Bus, SNMP, MQTT and more. 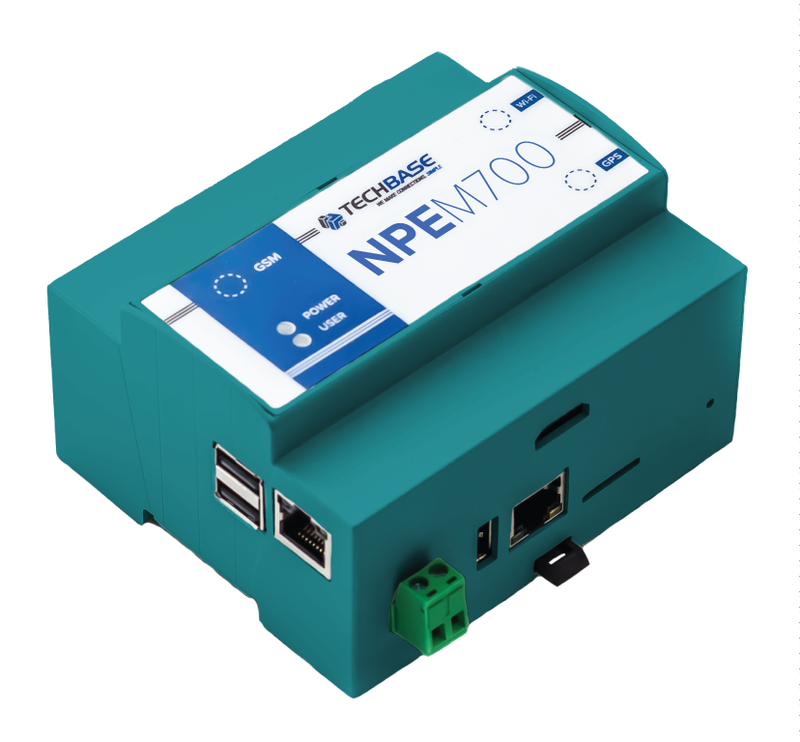 The NPE M700 platform has a variety of functionalities and is easy to configure at the same time – it combines ease of use, characteristic of simple devices with the possibilities of embedded computers. The design of the NPE M700 allows for trouble-free operation in industrial conditions. It has a fanless case and is characterised by high resistance to external conditions and high reliability. The Linux system provides stable operation of the device. NPE M700 is a multichannel telemetry module, providing constant uninterrupted access to data. It enables you to save the results of measurements and parameter values of connected devices - data can be saved to internal memory. You can also save data to internal and external databases. NPE M700 can generate alarm signals and provide information on current parameter values. Built-in LTE/3G/GPRS modem enables wireless communication. NPE M700 can operate as a typical PLC. The telemetry module can be programmed in ladder logic, which is easy to configure and allows for a quick start of an installation. Due to the Linux operating system - NPE M700 is a stable central unit of an automation system. With a built-in GSM modem, NPE M700 offers advanced functions and can be configured as an industrial modem and a router operating in GPRS, EDGE network as well as in 3G mobile network. You can easily get a backup connection mode and define routing. You can build a VPN with NPE M700. You can access other devices with one telemetry module with a defined public IP. The VPN guarantees high security of data transmission. Due to digital I/O and analog inputs, NPE M700 can successfully replace expansion modules. With a built-in GSM modem, the NPE M700 industrial computer can operate as a notify module: it can send alerts when defined parameter values are exceeded (e.g. temperature, humidity). You can easily and quickly configure the content of a message which is send instantly when the value is exceeded. System supervisor will immediately receive SMS or e-mail notification. GPS receiver allows to use the satellite navigation system. The system is widely used in vehicle monitoring (e.g. transport, railway industry or municipal communication). It allows to synchronize time in extensive industrial networks. It is also used to set a route for industrial machines. iMod Platform Support. NPE M700 can easily work with iMod telemetry modules and in nearest future with iMod M700. 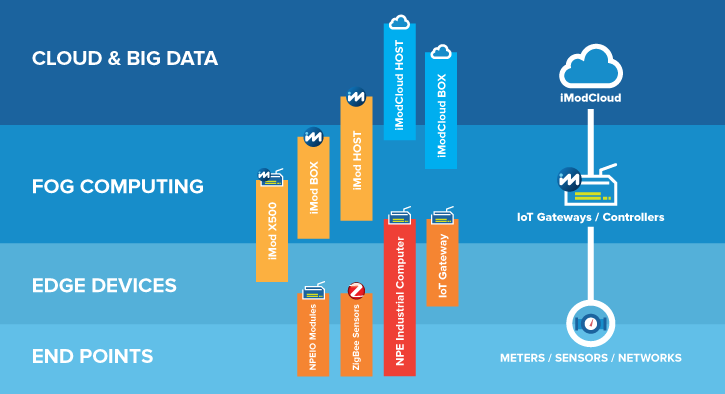 iModCloud Ecosystem. A combination of a cloud service with a web user interface and special industrial devices that are fully manageable remotely. 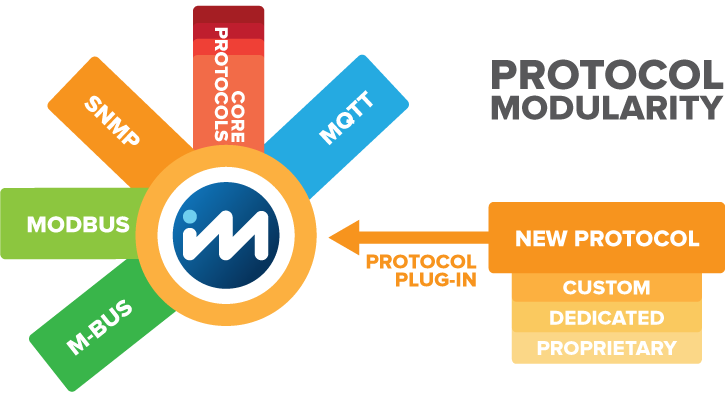 Core iModCloud Ecosystem elements are iMod controllers and iModCloud service. iMod controllers and iModCloud service together stand as a complete solution. iModCloud - a dedicated cloud service - allows you to visualize and control parameters of any number of devices via a web browser. Now iModCloud expands to support NPE M700 devices.